A city break in December is like no other month of the year; streets sparkle with thousands of fairy lights, squares and piazzas are filled with market stalls and the air is thick with the scent of mulled wine. Head far enough south – to Andalucia, for example – and you may still get a hit of summer warmth by day, although the nights will be chilly. But for the ultimate Christmassy weekend, head to eastern Europe, where there’s the greatest chance of snow, sub-zero temperatures and starry skies – the perfect December combination. One of the biggest reasons for a city break in December is to visit a Christmas Market. Originally a German and Austrian tradition, most major cities in Europe now have a traditional market running through December, but the traditional, gluhwein-and-lebkuchen markets tend to be found in cities such as Freiburg, Koblenz and Wiesbaden. You could also opt for one of these winter breaks in the snow – including three or four nights of cross-country skiing in Austria or snowshoeing in Switzerland. If you want to escape the crowds on Britain’s high streets and do your shopping somewhere a little more exotic, there’s nowhere to beat Marrakech. Be prepared to barter for beautiful ceramics, jewelley, leatherware and teak inlaid-boxes. 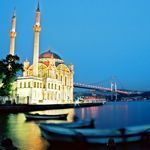 Or head to Istanbul for unique foodie gifts from the Spice Souk, and a mind-boggling array of silverware, bags, carpets and leather goods in the sprawling Grand Bazaar. Seville offers a range of different markets throughout December, from the Handicrafts Market on Plaza Nueva to the Seville Province Fair, which specialises in locally-produced foodie treats. But for classically elegant gifts, there’s nowhere better than Paris; take in the spectacular lights along the Champs Elysees or browse the boutiques of the Left Bank. The weather is always a bit touch and go on a December getaway, but a dusting of snow adds a touch of magic. Head to Eastern Europe or Scandinavia for the best chance of a white weekend. 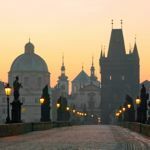 Prague is at its most beautiful in winter, with an outdoor ice rink and Christmas market in the heart of the city, and a programme of concerts and recitals at churches and concert halls throughout the month. If the chilly temperatures are a concern, pick Budapest, where you can combine shopping in the Christmas market on Vorosmarty Square with reviving afternoons in the city’s famous thermal baths. Or head to Stockholm to see a true city of lights; throughout December the city sparkles due to Stockholmsjul, when streets and squares are dotted with illuminated displays, glittering reindeers and floodlit buildings. Of course, a December weekend break doesn’t have to be about Christmas – many cities are far quieter in the depths of winter, making queues shorter for major attractions. In Florence, instead of queueing for an hour to gain entry to the Uffizi Gallery, you can simply walk straight through the doors. Similarly in Rome, the crowds at the Vatican Museums are far smaller, making the whole experience more enjoyable and atmospheric. But if what you crave is a little old-school glamour to offset the Christmas bling, there’s nowhere better than Vienna. Pack black tie and a floor-length evening dress for an evening of dancing at the New Years’ Eve Ball at the Hofburg Palace, or soothe a thick head with world-class classical music at the annual New Years’ Day concert on the morning of January 1. Or escape the whole shebang and head to Norway’s northernmost city, Tromso, where there’s an excellent chance of seeing the most spectacular Christmas lights of all, the uniquely beautiful Aurora Borealis. Another exciting way to view the Northern Lights is from one of these Glass Igloos in Lapland.